Noodle-like strings containing living cells have been made by researchers in the US. Simple to make, these 'cell wires' are a step towards exciting medical treatments, such as helping to repair tissue in the heart and spinal cord, or the design of artificial muscles. 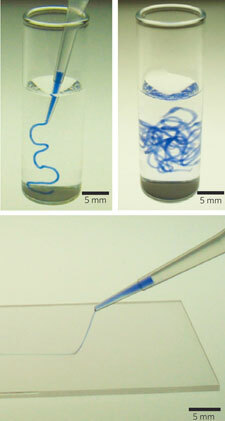 To make the strings, Stupp's team took a solution of amphiphilic peptides that are known to self-assemble into bundles of nanofibres. The solution was heated to generate a liquid crystal, then squeezed through a pipette into salty water containing either sodium chloride (NaCl) or calcium chloride (CaCl2). knotted or rolled up, and are available in a range of thicknesses by varying the diameter of the pipette. Next, the team integrated stem cells into the peptide solution, which were able to survive the synthesis and become trapped in the structure. Once inside, the cells were observed to proliferate inside the structure and grow in uniform directions. To demonstrate the potential of the process, the team produced filaments containing cardiomyocytes: heart muscle cells that spontaneously generate electrical signals. Around 10 days after the strings had been produced, the cells had grown to fill the structure and electrical signals could be seen travelling up the full length of the string. 'This work represents an important step forward in creating artificial muscles,' says Hongbin Li, who has recently designed artificial proteins that mimic muscle tissue at the University of British Columbia in Vancouver, Canada. 'It also represents a new tissue engineering scaffold that may help to repair muscle or nerve damage in patients,' he adds. 'This is an innovative and exciting approach,' agrees Nenad Bursac, an expert in cardiac tissue engineering at Duke University, US. However, there are still big challenges to overcome before this technology reaches the clinic, he adds.